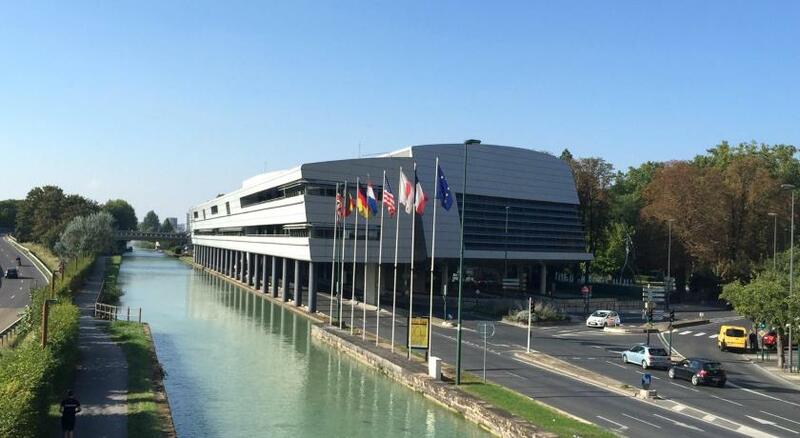 Lock in a great price for ibis Styles Reims Centre – rated 8 by recent guests! Met the minimum requirements for a stay. The staff was friendly. Just a short walk to the main attractions of Reims. Comfortable rooms , clean , nice and helpful staff - they over charged our stay but promptly made correction before we protest and complain! This hotel is next to public parkings with plenty of spaces and lower fees. AND is within easy walking distances to center town and all attractions. The convenience of the facility from the interstate and the center of town, easy parking and comfortable room. Staff at front desk were very nice and their English was very good. An important factor in choosing this hotel for this particular trip is that it has its own secure parking. You need to check in early though as space is limited. The hotel is conveniently situated but could be noisy traffic wise if one had to have the window open. We stayed in winter and this was not an issue although it was really too warm for us. 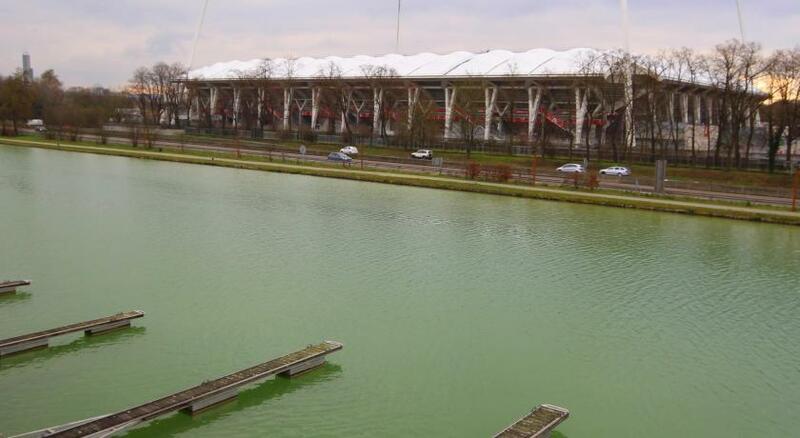 I wonder how well the air conditioning would cope in summer? The room was small but adequate given it is a budget hotel. The style of the hotel is not really to my taste. If you can secure a good rate though the hotel is fine. Rooms were comfortable and quiet. Beds were comfortable. The complimentary breakfast had many choices to please all travellers. On site parking was only 11Euro per night. There is public parking across the street for 4Euro. Close to cathedral, blocks from restaurants, walkable to shopping and events. Evening safe walking with friends. Staff helpful. Unaware of 11€ parking charge until checking out. Convenient location. This is a budget hotel, our room could use updating. Very small room, but adequate. Relatively short walk to downtown. Parking in lot behind hotel (12 Euros), or across the street in the public lot, which is cheaper (4Euros). Only stayed for a 1 night stopover but hotel was clean and comfortable and in a good location for walking into the town. 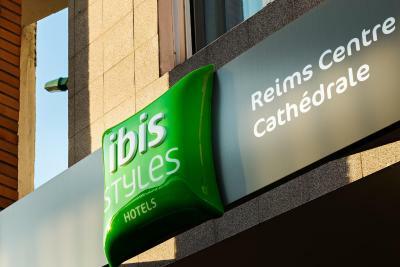 ibis Styles Reims Center is located in the center of Reims, 2,450 feet from Noter-Dame Cathedral and a 6-minute walk from the congress center. Free WiFi access is provided throughout the property. The contemporary guest rooms have air-conditioning, a flat-screen TV with satellite and English language channels. They also have modern private bathrooms. A buffet breakfast is included and served daily at the property. The hotel has a bar with a jukebox, magazines and a Fatboy bean bag, and the on-site restaurant serves traditional French cuisine. There is also a business center and meeting rooms are available. Private exterior parking is possible at an extra cost. The ibis Styles Reims Center offers easy access to the A4 motorway to Paris. Saint Rémi Basilica is 1.1 mi away and the Palace of Tau is 2,300 feet from the property, while the Beaux-Arts Museum is 2,150 feet from ibis Styles Reims Center. 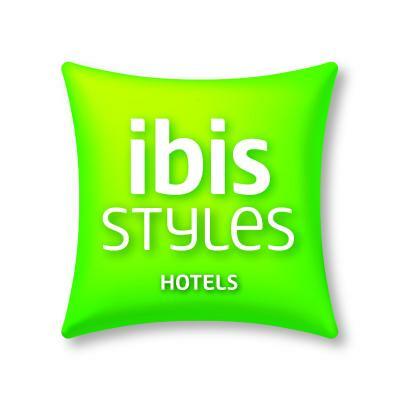 When would you like to stay at ibis Styles Reims Centre? With contemporary décor, this room features a private bathroom and a TV. House Rules ibis Styles Reims Centre takes special requests – add in the next step! ibis Styles Reims Centre accepts these cards and reserves the right to temporarily hold an amount prior to arrival. The bar was in the process of being renovated so there was nowhere to eat or drink in the hotel. Secure parking, very friendly staff. Good position for city and motorway. The standard suite was quiet spartan in terms of space and decor. A mini-fridge at this price point would have been nice. Very plain and standard breakfast; so we decided to eat elsewhere. The breakfast is good but with limited choice. A little bit more choice would be great. Not a real problem, just wish these budget hotels would give more space for personal toiletries in bathroom.